If you’re like many people, getting out to exercise on the darkest days of the year may be the last thing that appeals but the rewards are more than worth the unpleasant temperatures and slushy sidewalks. As a study in the British Journal of Sports Medicine reports, people who are in better physical shape and get at least 20 minutes of aerobic exercise on five or more days per week are not only much less likely to get a cold, but will also have milder symptoms than those who are less fit and don’t exercise as much. To study the connection between physical fitness and the likelihood of catching a cold, US researchers looked at 1,002 men and women, ages 18 to 85, for 12 weeks during the fall and winter months. Before the study began, the people rated their own fitness level and gave information about how often and what types of exercise they engaged in. If they caught a cold, the participants rated the severity of their symptoms and noted how long their illness lasted. The number of days with a cold in people who exercised five or more days per week was reduced by 43%; the number of days sick for those in the “most fit” category went down 46% compared with those in the less fit groups. The severity of symptoms was also significantly less in people who got regular physical exercise and were more fit. Get your rest. Proper restful sleep is vital to a healthy body and mind. Aim for eight hours per night, or more if you need it. Getting enough sleep improves heart and immune system health, and when you have a cold, rest is vital to the healing process. It is during the sleeping hours that the body does its repair work. Skimp on sleep and it will probably take longer to get back on your feet. Eat well. Sugar suppresses the immune system, and the same goes for juices and other concentrated sweeteners. Focus on foods that contain complex carbs (like whole grains and legumes) and a variety of richly colored fruits and vegetables. And don’t forget the chicken soup if you do get a cold. The steam helps loosen congestion and the mineral-rich broth helps keep you hydrated. Exercise, in moderation. People who regularly engage in intense physical exercise (like training for a marathon) are actually more likely to get sick. This type of exercise is tough on the body, increasing levels of inflammatory molecules and suppressing the immune system. 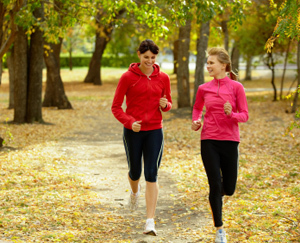 Moderate activity seems to be the best for immune health; try jogging, fast-paced walking, swimming, or cycling.